Review: 2014-03-14, good finish and great performance by both fighters: the third fight between Daniel Straus and Pat Curran gets three stars. Daniel Straus entered this fight with a professional mma record of 22-4-0 (36% finishing rate) and he is ranked as the No.5 featherweight in the world, he comes off six consecutive wins and in his last fight he won the Bellator Fw belt defeating Pat Curran in their second bout (=Curran vs Straus 2) while in their first fight the winner was Curran (on April 17, 2009). His opponent, Pat Curran, has an official record of 19-5-0 (58% finishing rate) and he entered as the No.9 in the same weight class (currently the #1 in this division is Jose Aldo). 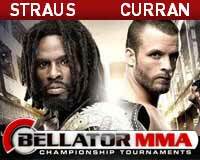 Straus vs Curran 3 is valid for the Bellator featherweight title (Straus’ first defense); main event of Bellator 112. Watch the video and rate this fight!